Melanoma is the most serious form of skin cancer and is often referred to as Australia's national cancer, as Australia has the highest incidence of melanoma in the world. However, there is currently no curative treatment once the disease spreads beyond the original site. To address this major Australian health problem, I have been working on translational research in melanoma with a focused theme of “overcoming resistance of metastatic melanoma to treatment” for more than 10 years. I am determined to dedicate my research career to translational melanoma research and will expand my existing research program by strengthening clinical needs-based melanoma research, incorporating new biomedical research frontiers into melanoma research, and introducing novel biotechnologies to melanoma research. By doing so, I wish to become an internationally recognised authority in translational melanoma research, to continue to build up a highly competitive research team, and to attract more funding, junior researchers and students into the cancer research field. 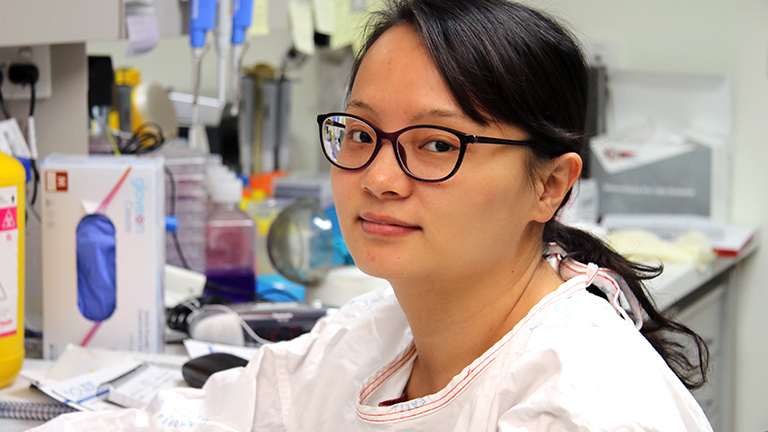 Dr Jiang has been working on translational research in melanoma with a focused theme of “overcoming resistance of metastatic melanoma to treatment” for more than 10 years. She is currently in charge of the signal transduction team in the Melanoma Research Laboratory, which includes three research assistants and three PhD students. Dr Jiang pioneered studies on “understanding adaptive mechanisms of melanoma cells to endoplasmic reticulum (ER) stress”, which has provided a number of insights into resistance mechanisms of melanoma to apoptosis (normally programmed cell death) induced by ER stress (a condition which alters the normal expression of proteins in a cell). No one else has investigated ER stress in melanoma, and its effect on melanoma cell survival and responses to treatment, as systematically and as comprehensively as she has. Dr Jiang was also among the first to show that the inappropriate activation of survival pathways plays a critical role in the resistance of melanoma cells to cell death induced by various chemotherapeutic drugs. More recently, she has become a leading figure in the investigation of the roles of microRNAs (molecules involved in the regulation of gene expression) in the regulation of melanoma cell survival and proliferation. Dr Jiang's work has resulted in 62 research publications in high impact journals including Nature Communications, PNAS, Cancer Research, Clinical Cancer Research, Autophagy, Oncogene, Cell Death and Differentiation and Cell Death and Diseases. Her career publications have attracted more than 1500 citations, an outstanding number for an early-mid career researcher. She was awarded the “Woman in Cancer Research Award” and the “Sanofi-Aventis Scholar-in-training Award” by the American Associated for Cancer Research in 2015 and 2010, respectively. Dr Jiang has ongoing collaborations with a large number of researchers locally, nationally, and internationally. She has established productive collaborations with Professor Rodney Scott locally and Professors Richard Kefford and Richard Scolyer nationally. She has also established collaborations with researchers from many universities in China. Productive collaborations with researchers in China not only attracts high quality students and visiting academics, but also enables applications for funding as a collaborator from various sources in China. Dr Jiang is an active participant in activities of academic organisations. She is a member of American Association of Cancer Research, the Australia and New Zealand Melanoma Trials Group, the Melanoma Tumor Group of the Hunter New England Area Health, and ASMR. She also regularly presents her work to various community groups and writes newsletters for local medical research associations. Through collaboration with pharmaceutical companies, Dr Jiang's research has contributed to the decision-making in planning and executing clinical trials with targeted inhibitors of the MAPK pathway, a central signaling pathway in all cells.